I am closing out Food Week with a taste-test. 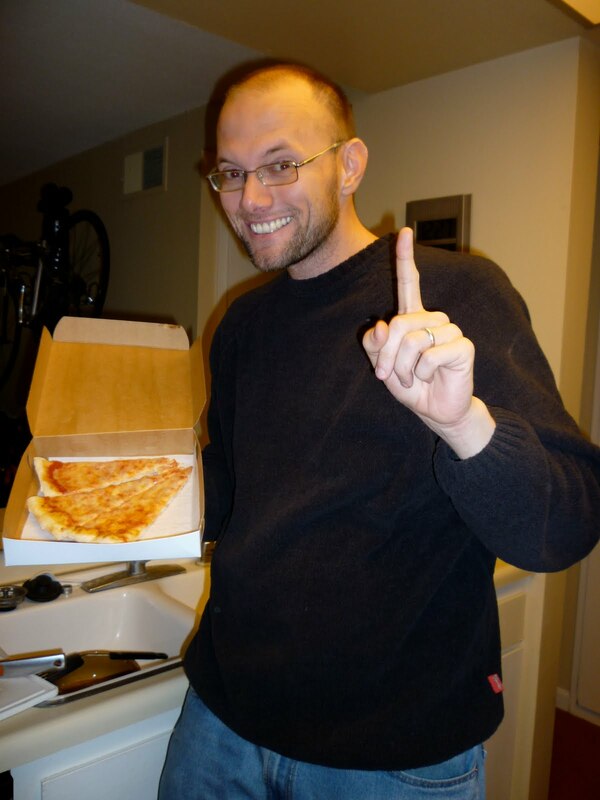 Bryan and Veronika have forever been touting what they think is the best pizza in San Diego. I have my own opinion, too, and so decided we'd settle this once and for all. As a native New Yorker, Bryan claims that the best NY-style pizza in San Diego is at a little place in PB across from the library. An added quirk, he says, is that it's run by an Asian family. God bless America. You must also bear in mind that, while Bryan touts this place as the best, he hasn't been in six years. When ordering today, we learned that the place had been sold three years ago to an exuberant Italian man named Mateo. Which I thought boded well for BO's choice--pizza from Italy. Veronika thinks Bronx Pizza is the best slice in town. This place is tiny and does a lot of take-out service, but you can also eat in their cramped little back room. New Yorkers work here instead of Asians or Italians, and they have the attitude to prove it. 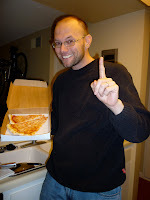 Since this is my blog, I get a say in the contest, and entered Costco's pizza. We each purchased one slice of plain cheese pizza from our favored establishment and brought them to Veronika's condo. We then cut each slice into thirds and put one each on a paper plate, labeling the rim with the establishment's name. One by one, we were blind-folded and tested each pizza. The taster's comments were recorded in a notepad, and each taster had to ultimately pick their favorite. 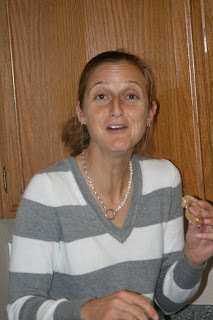 Veronika: Good spices in the sauce. The crust isn't too hard. Michelle: Good sauce, good flavor. It has more oregano, I think? The sauce smells a little like pepperoni. Bryan: I smell spices. The crust is thin. I like that. The sauce is flavorful. Surprisingly, the pizza's a little greasy. Veronika: I like it. I like the mix of the sauce and the cheese. Nice consistency throughout. Bryan: Not as aeromatic as the other (Bronx) one. Definitely not as flavorful. But it's simple. It's not as greasy. Veronika: The cheese isn't as soft as the others. Michelle: Nice aroma. Smells good. It has more cheese, less sauce. It's satisfying. Bryan: The cheese is crispy. I like that. 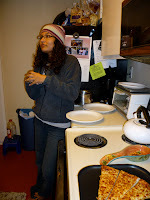 In the end, while still blindfolded, we each picked the pizza we'd nominated for the contest. But afterwards, we also agreed that Bronx was the most flavorful. On "Top Chef," contestants sometimes prepare an ingredient multiple ways. "Kobe Beef Two Ways" or "Salmon Two Ways." Today, I offer you a Thanksgiving leftover--yesterday's cranberry relish--prepared five ways. I used a basic Bisquick recipe and added 1 1/2 cups of cranberries. Comment: "The high points are the cranberries and nuts. But they're a little doughy." I agree. Next time, I'll use a real muffin batter recipe. Equal parts salsa and relish, plus a few drops of Marie Sharp's hot sauce. Bread, brie, cranberries, more brie, a second slice of bread. It's then grilled in a pan with butter. Comment: "On a scale of four, it's a five." I agree, this is aMAZing. Along with leftover cranberries, we also have leftover apricot-walnut-crouton salad. So I added a little balsamic vinegar, olive oil, and cranberry juice to the relish, and then poured it on the salad. I found this idea online, but can't find the link. Turkey burgers topped with cranberries would've been to easy. Inspired by the above-linked recipe, we decided to make cranberry-stuffed meatballs. Several of them split open, but not too much spilled out. 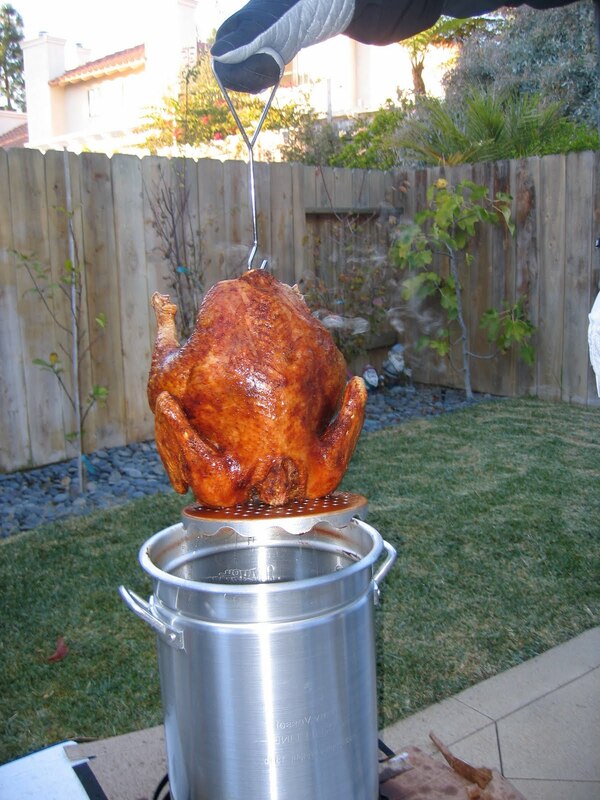 After the photo was taken, we topped them with turkey gravy. Comments: "Now THAT is one satisfying dinner." It's been a good run, but I hope tomorrow will be cranberry-less. Nothing I could post here could adequately sum up this Granddaddy of all food days in America. So I won't even try. Instead, I humbly offer you a cranberry relish recipe, which my dad and I first started making when I was in high school. Of course, you can double, triple, quadruple, et cetera the recipe to fit your feasting needs. We also make this relish at Christmastime. Put the water and sugar in a large pot and allow to boil, stirring occasionally. Once it boils, turn the heat down to medium and add the cranberries. Let these cook for about ten minutes, or until the cranberries start to pop and cook down. Then add the tangerines, apple and apricots. If the relish is boiling and splattering, turn heat down to medium-low. Finally, add the walnuts and allow the relish to continue cooking. If it seem too thin, raise the heat and some water to boil off. Finally, turn off the heat and allow to cook. Relish can be served either warm or chilled. With tomorrow's impending gluttony, I just couldn't eat something good enough to post about (despite a lead on a Peruvian restaurant). 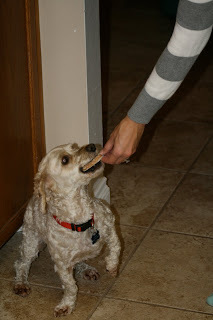 Thankfully, Louie--the cockapoo with a bottomless stomach--agreed to take one for Stray Carrier Pigeon, and let me cook for him. While the canine carrot biscotti was intriguing, I don't make anything for a dog that requires more than five ingredients. I hardly cook anything for myself that requires more than five ingredients. So Louie got garlic-spiced donuts. I've never had a garlic-spiced human donut before, but they do exist. It's been two hours and Louie hasn't shown any signs of stomach distress, so I am calling these biscuits a success. 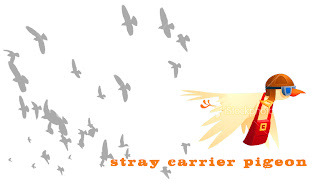 With yesterday's deep-fried turkey post, and Thursday being Thanksgiving, I am making this Food Week at Stray Carrier Pigeon. A few weeks ago, I referred to the peanut butter and butter sandwich of my youth. This is a snack/meal that I loved to make. Today, I reprised it for lunch. How was my dining experience? It wasn't a sandwich that I particularly enjoyed, although I did eat the whole thing (too much energy to fix something else). I chalk the pb&b up to youth and an immature palate. Bp& j is successful because it combines creamy peanut butter with sweet jelly. Just like butter and jelly on an English muffin (a pre-run favorite!). Or waffles with butter and syrup. Of the pb&b, I think Tom Coliccho would say it lacks flavor range. ...because one Thanksgiving meal isn't enough. 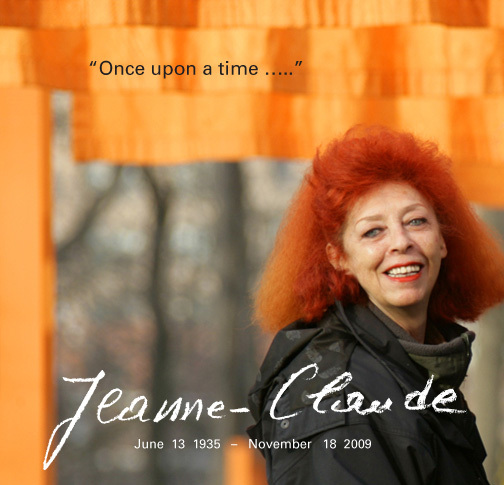 I was poking around the Time website, looking for a picture to include in a blog post on a different subject, when I learned that Jeanne-Claude, Christo's partner in life and art, passed away yesterday. I first saw the work of Christo and Jeanne-Claude on "Sunday Morning", which chronicled them and their Umbrellas installation. When people talk about these Umbrellas, or about the Reichstag, or the New York Gates, they talk about Christo. But he had another half. I'm not going to get all feminist on you. If, by reading this blog post, one more person will know Jean-Claude's name, I will be exceedingly happy. An artist-friend was recently lamenting to me how art is not purposeful. But it is. The sublime is necessary. I am reminded of a comment made in one of my fiction workshops at Maryland, shortly after 9/11. My workshop mate said of fiction, and art, "In some ways, it doesn't seem to matter very much right now. In another way, it's the only thing that matters." Thanks, Jeanne-Claude, for things that matter. "Just yesterday, when we were all a little calmer and safer, my younger brother put his palms on the oven of her and murmured duck, duck, I want a duck as if words alone could make the thing inside her grow feathers." Lately, many people around me--and when I say "around me," I include myself--are wishing for things to be other than they are. None of us wish our bellies--or any of the bellies around us--to contain a bird instead of a fetus. No, our angst centers around jobs/careers/what we do each day/what we call ourselves/what others call us. In other words, identity. Which is a theme Lisicky dealt with several times this evening. I would be remiss if I didn't mention the duck that is held hostage in Richard Russo's Straight Man, where the protagonist, a long-suffering English professor at a financially struggling college, cries, "A duck a day, until I get my budget." How did ducks come to represent such futile yearning? Hopefully there's a PhD--who self-identifies as an modern American lit expert--secreted away in some dank office, toiling on this very topic. Last night, I found myself wandering around a place I spent five years at, and wondering where the hell I was. I'd gone to UCSD for Dime Stories' November Showcase, to hear, among others, my friend Nancy read her award-winning story. Which was great. What the pluck?--I don't know why she was nervous. I'd parked in the Gilman Parking Structure, which was built after I'd graduated, but I'd become accustomed to it when I'd returned as an employee. I stopped working there in June of 2007, and since then the campus has exploded with buildings. One of which is a new student center that makes UCSD a real college and give it a real central place for students to hang out. Which is a good thing. As along as you can navigate all the other bright and shiny and windowy buildings. I am a fan of American Chopper. Watching the Teutul family is a melange of action, engineering, graphic design, comedy, drama, and family. Bravo. No, not Bravo. Bravo. As we are in the middle of November Sweeps, I feel compelled to write to you about your other shows, which all seem to be about about freakishly large families. (Freaky, freakier, and still more freakiness.) They are taking over your network. I understand that shows are in the works for several months before going on the air. Perhaps you lined up all these crazy families before the Jon and Kate lost the love. TV executives live and learn. So in the spirit of living and learning, I humbly suggest you find something else to exploit. The only monstrous family I want to see on TV is one made of up of adopted or fostered children. If at all possible, it'd be great to follow the lives of a family who takes in the children of an immediate family member, after their tragic death in a car accident. Margaret's death had shaken us, like three dice in a cup, and spilled us out with new faces in unrecognizable combinations. We forgot how we used to live in our house, how we'd passed the time when we lived there. We could have been sea creatures stranded on the beach, puzzling over an empty shell that reminded us of the ocean. 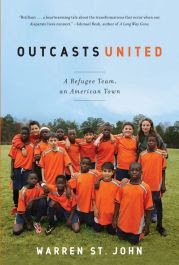 I'd like to thank the good people of San Diego for voting for the same book I did--Outcasts United. I will soon be racing all of you to the book stacks to borrow a copy. But don't worry, I was raised better than to push. Although my brother did teach me how to hold my own (elbows out) several long years ago in a Smashing Pumpkins mosh pit. I first heard about Early Bird from the above Bill Geist piece on "Sunday Morning". I'd been interested in the book at the time, but well, so many books, so little time. 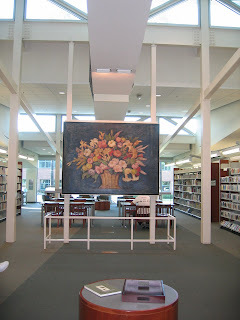 But I stumbled upon the book again recently, during one of my library tours. And I just had the book transferred to my local branch. Here's the premise: a twenty-eight-year-old former "Late Show" writer moves to a Floridian retirement community to see what his life will be like in forty years. He joins the shuffleboard community; hangs out by the pool with the gossipers; befriends a ninety-three-year-old, foul-mouthed comedienne; and even falls in love with a woman...who's younger than him. Same great literary content, nine less characters to type. A writer friend whom I met at Tomales Bay, John, believes that fiction can make humanity better. After reading The Road, I agree. Who knew that a father giving his son a can of Coca-Cola could be so beatific?